Active Layers — the top and bottom outer or active layers are manufactured from NOK’s NBR pre-coated stainless steel ensuring excellent micro sealing of engine fluids with precision embossing around critical sealing points to provide additional fluid sealing performance. The use of pre-coated materials ensures greater control of the coating thickness for optimum pressure distribution over the entire gasket. Control Layer — the centre or control layer is manufactured from steel and ensures the head gaskets overall thickness tolerances are met. Stopper Layer* — manufactured from stainless steel and measuring only 0.15mm thick the stopper layer features a precision fold around the cylinder bores creating a load point around the combustion chamber. Combined with additional embossing on the active layers the stopper layer delivers truly superior sealing of combustion gases. *Excludes S2096MLSR which has coined edge due to engine design. Here is a list of the current applications, with more to be added soon. Today’s modern engines feature compact, lightweight cylinder blocks and cylinder heads. In the never ending quest for greater power output engine builders can add forced induction systems such as turbocharging, supercharging or nitrous injection; modify electronic induction system controls and install performance engine components. The combined result; extreme combustion pressures and to reliably seal these pressures requires an advanced head gasket design. Permaseal are now adding to their reputation for high quality gaskets with the introduction of Permaseal MLS-R High Performance. 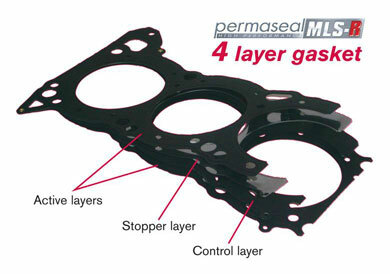 The Permaseal MLS-R range of head gaskets has been developed to meet these very rigorous requirements. Engineered, designed and manufactured in Japan to exacting tolerances Permaseal MLS-R head gaskets offer the performance engine builder the highest levels of uncompromising quality. Permaseal MLS-R head gaskets incorporate state of the art four layer design and with the extensive use of stainless steel materials allows each individual layer to be thinner delivering increased rigidity and durability. Other benefits from the use of stainless steel materials in the construction are uniform heat distribution and improved thermal transfer between the cylinder head and block of the engine and a balanced; even distribution of clamping loads across the entire sealing surface minimising cylinder bore distortion. The extensive use of stainless steel materials allows each individual layer to be thinner delivering increased rigidity and durability. Other benefits from the use of stainless steel materials in the construction are uniform heat distribution and improved thermal transfer between the cylinder head and block of the engine and a balanced; even distribution of clamping loads across the entire sealing surface minimising cylinder bore distortion. It is the stopper layer that sets the true high performance gaskets apart from competition.